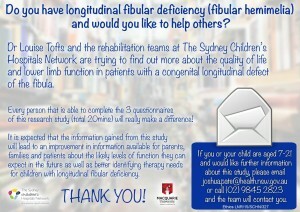 Do you live in Australia and are the parent of a child (aged 7 – 21 years), or a young person yourself, with congenital fibular hemimelia and would like to help others? Dr Louise Tofts and the rehabilitation team at The Sydney Children’s Hospital Network are trying to find out more about the quality of life and lower limb function of children and young people with congenital fibular hemimelia. This research study involves three questionnaires, and it is expected that the information gained will greatly improve outcomes for Australian families and children with congenital fibular hemimelia. For more information click on the flyer below or contact Joshua Pate at joshua.pate@health.nsw.gov.au or call (02) 9845 2823. Train as a Parent Peer Support Volunteer September Limbs 4 Kids E-News goes live!